Silver Metal Chain Beaded Curtains for Salons, Homes, Nightclubs, Restaurants, Retail Display and More. For Custom sizes choose from Fabric, Straight Metal, or Bendable Metal Top! This stock size 3' x 6' that you can order on this page comes with a straight rod as seen in the video. Our Chain Curtains are made to order here in the U.S., right here at ShopWildThings in Arizona! 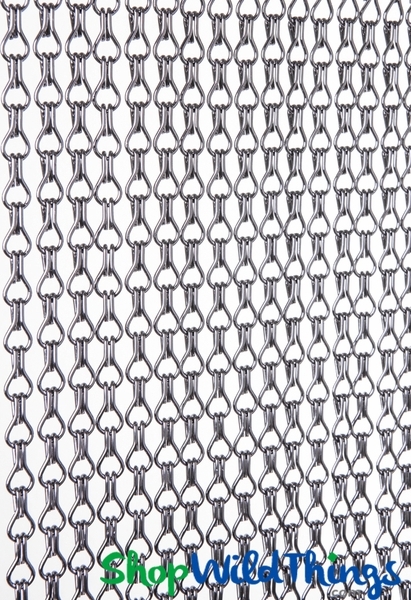 We know you've seen these Aluminum Chain Curtains in restaurants, clubs, and high end homes. Now is your chance to get the look for less with ShopWildThings! we've been working for two years to bring these to our product line, and they are finally here, they are totally fabulous! Each curtain features 68 strands of chain. These are not just fabulous. They are so rad that we are putting them everywhere we can think of. You can use them as a room divider, in a window or in a doorway. The chain links themselves are 22mm tall (not quite an inch). We have designed a very cool header rod with holes drilled out from which each chain hangs. The header rod is silver aluminum (very heavy duty) and measures 35" wide. The rod is 2" tall and each strand is 72" long for a total overall length of 74" long. If this is too long, simply remove some links. 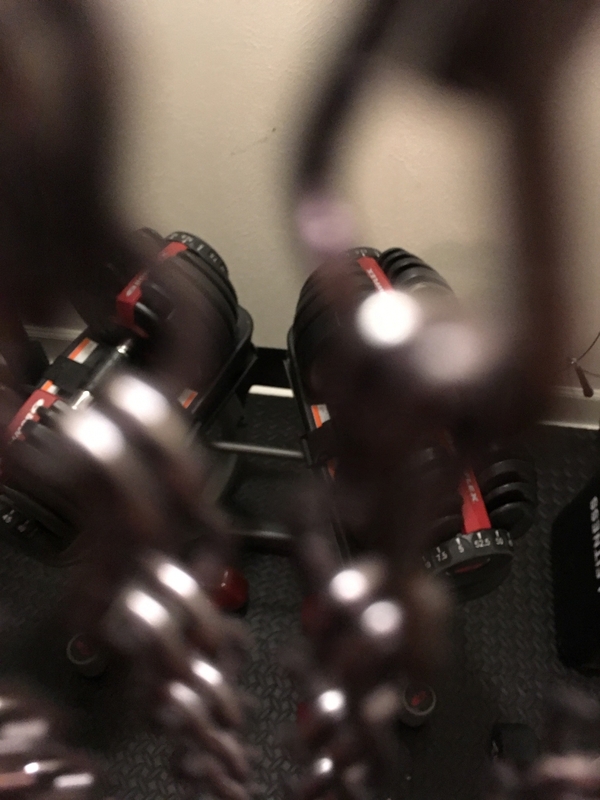 HGTV's hottest designer, David Bromstad, did a huge custom installation in the House of Rock in Santa Monica, California using our chain curtains. See the finished product HERE! We are LOVING working with David Bromstad! 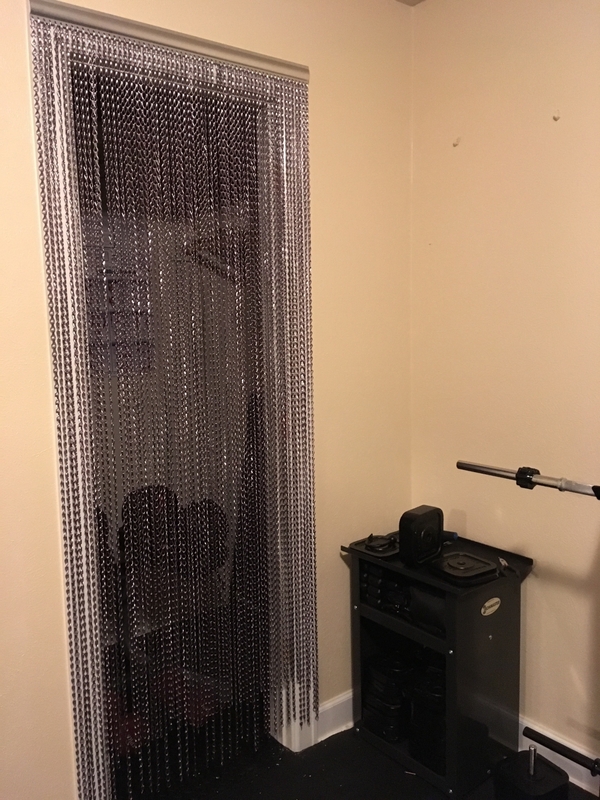 We are also offering custom size Chain Curtains. See our Metal Chain "By-The-Foot" Custom Curtain Pricing section. We also still offer our selection of "Faux" metal ballchain curtains which are made out of acrylic beads. The link to those is on the right. Prices on those start at $29.99 for a 3' x 6' long panel. We also have the in-house capability to add this chain to fabric and add hanging grommets. Please call us for a Custom Quote. And we gotta brag a little. This is Billy Duffy from The Cult. I love this curtain! 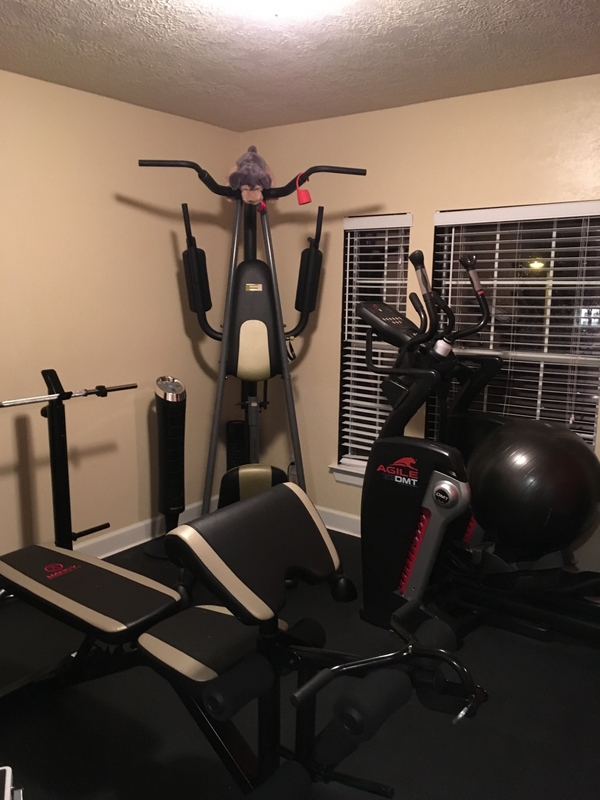 I remodeled my home gym and needed to remove the closet door to allow for more space. The curtain was perfect. I cut 6 strands off of the width and used them to fill out the perfect length. I have been around the block a few times and wanted something different for the bathroom. Slate floor, and leather rug, Gun metal accessories. ( don't laugh) this works. Also a lot of soft touches.. I really love this look. Love the look of these curtains. They were easy to install and they look so cool. I need to cut 4 inches off the width and used the extra to add to the length. it was a lll very easy to do.